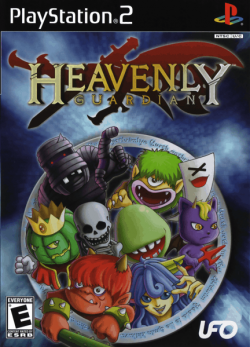 Game description: Heavenly Guardian embodies the fast paced fun and adventure of the classic arcade shooter while utilizing the powers of the PlayStation 2 to add new thrills to the genre. Journey through various environments and fight through a variety of mythological creatures! Fight the journey solo, or gain the aid of your companions in cooperative two-player action. Search for power-ups and special items to vanquish the evil gods and save your love from death. The Snow Fairy Sayuki is on a quest to save her beloved from the evil curse of the demons plaguing her land. In order to save her companion's life, she must travel through the far reaches of ancient Japan and battle mythological creatrues in her pursuit of a secret remedy. Kiki Kai World embodies the fast-paced fun and adventure of a classic arcade shooter while utilizing the powers of the PlayStation 2 to add new thrills to the genre. Journey through various environments and fight through a variety of mythological creatures! Fight the journey solo or gain the aid of your companions in cooperative two-player action. Search for power-ups and special items to vanquish the evil gods and save your love from death.